The year is 1633. Tensions are running high in the small German city of Klosterheim. The Thirty Years' War rages on, as the Emperor contends with invading Swedish forces, and, closer to home, the marauding robber chieftain Holkerstein and his armies threaten to destroy the town and kill every man, woman, and child in Klosterheim. But not all the townspeople's anxieties originate from without: within the city, too, there is danger at every turn, as the usurper prince tightens his grip on the town and targets those, like the brave Count St Aldenheim, the virtuous Maximilian, and the lovely Paulina, who pose a threat to his reign. And when a mysterious, disguised figure known only as The Masque appears on the scene, apparently murdering and kidnapping Klosterheim's residents with impunity, terror runs rampant. Who can he be, and who is his next victim? The evil prince is determined to find out, and he devises an elaborate trap in the form of a masked ball, but little does he realize that The Masque is always one step ahead of him, plotting a deadly and inscrutable vengeance! 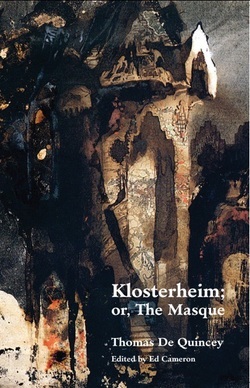 Klosterheim; or, The Masque was first published in 1832, and it reveals De Quincey's love for the Gothic novels of Horace Walpole and Ann Radcliffe, which he had read in his youth. It is also, as Ed Cameron discusses in his introduction to this edition, inextricably linked to De Quincey's theories on aesthetics and murder, as most famously expressed in his essay "On Murder Considered as One of the Fine Arts."